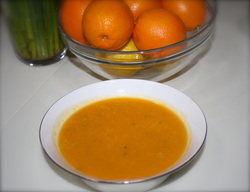 www.worthyfood.net - Healthy food and recipe blog. Sharing simple recipes for worthy food. It's not the lettuce that will cure our ills - it's the fruit and vegetables, the whole grains, the missing chocolate, the potatoes without goose fat, lean meats not glazed meats en croute… Fill your body full of goodness using all the fare at your disposal. Keep it exciting and you might keep it up. Here are 3 vegetarian dishes full of flavours inspired by Indian and Cuban cuisine - the only leaf in sight a scattering of coriander. The whole grain of brown rice gives you lots of fibre and minerals without a lot of calories or fat. Chickpeas (and other legumes), also high in minerals and fibre, are an important source of protein for vegetarians. First make rice: rinse rice and put in saucepan with double the amount of water. Cover, bring to boil and turn down to simmer for 25 minutes. Drain rice of any excess water when finished. In a non-metallic mixing bowl, add marinade ingredients: olive oil, lime juice, paprika, oregano, sea salt, black pepper, cumin and garlic. Mix together. Dice onion, pepper and tomatoes and add to bowl. Toss well in marinade to coat. Add chick peas and toss again. Put marinated veg and beans into a casserole, dutch oven or large saucepan that has a lid. Cook over a low heat, stirring occasionally, for approximately 25 minutes. Long enough for chickpeas to soften, but before peppers have gone mushy. Put rice into bowl used for marinating to get the most of the flavors - as there is no meat in the this recipe, the marinade isn't contaminated. Add the cooked bean/veg mixture and mix gently to combine. If you're not vegan, you can serve with a dollop of low fat yogurt mixed through to add creaminess, though it's not necessary. This spinach and potato Indian dish can be used as a side or a main depending on your view of what makes a meal. Don't forget - potatoes are a health food! Don't let their relatively high glycemic index rating keep you from eating them. 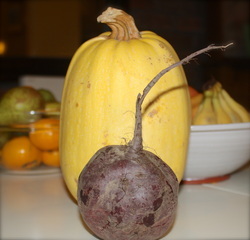 They are a low fat & calorie, nutrient dense vegetable. Peel and dice potatoes - put into a pot of boiling water and parboil for 7 minutes. The potatoes should be slightly soft; not hard but not too mushy. Drain and allow to dry. Put 2 tablespoons of olive oil into a wok or large pan, heat and add potatoes. Cook for 5 minutes, stirring frequently to prevent sticking - midway thru sprinkle with sea salt. Remove potatoes from pan and set aside for time being. Add spices and onion to wok/pan and stir fry for a few minutes, coating the onions. Add 6 large handfuls of washed spinach. Toss to coat with spices and then add 1/4 cup of water, stirring constantly. Add 1/4 cup freshly squeezed orange juice (can use lemon juice - but I like the sweetness of the orange juice paired with the garam masala and spices.) Stir. Add the potatoes back in and stir through. Finish with a few twists of black pepper. Rinse lentils and prepare squash, onions and garlic. In a large saucepan or stock pot, sauté onions in olive oil. Add garlic and spices: cumin, turmeric and cayenne pepper. Add butternut squash and lentils. Mix through. Add water, stir and cover to cook for 25-30 minutes. Check to see that lentils and squash have softened. Taste to check seasoning and add a little salt and/or pepper. Add lemon juice, stir through. 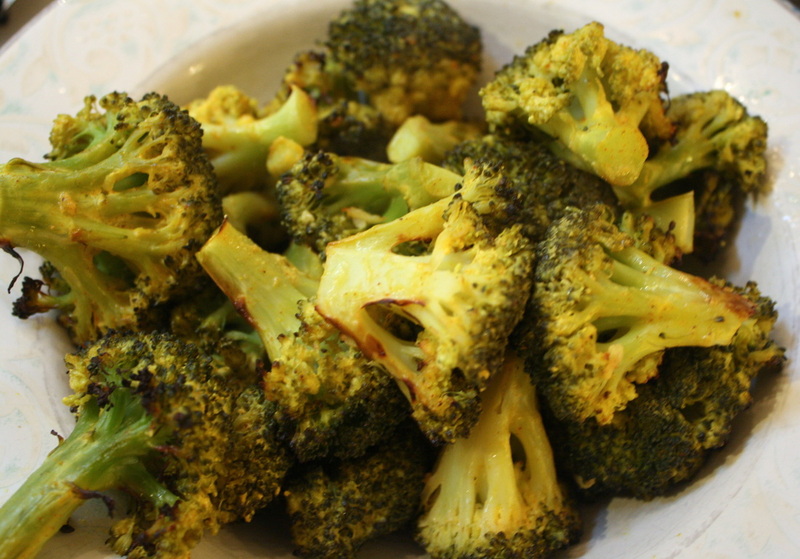 Serve with a dollop of low fat natural yogurt (unless vegan) and sprinkle with a few torn coriander leaves. Christmas Eve preparations have begun! As I stand at my counter, making first the cranberry sauce, then the stuffing, and finally, my first - hopefully! - pavlova, Bing Crosby is singing and I'm dreaming of my mother at Christmas. I remember helping her make cookies - adding a small bit of jam to the Cream Cheese Foldovers, rolling the Pecan Butter Balls in icing sugar. They were her favorite, and are now mine. 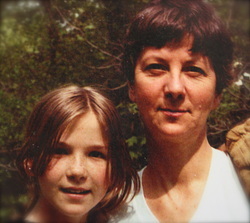 I remember ripping the bread into chunks for the stuffing, and that she used to store the stuffing for the night in a big pot out back. With a rock on the lid so no squirrels would feast on part of our feast. Holiday meals shared with our families are the foundations for traditions that our children will carry with them. So remember to include your children in the preparations this year. 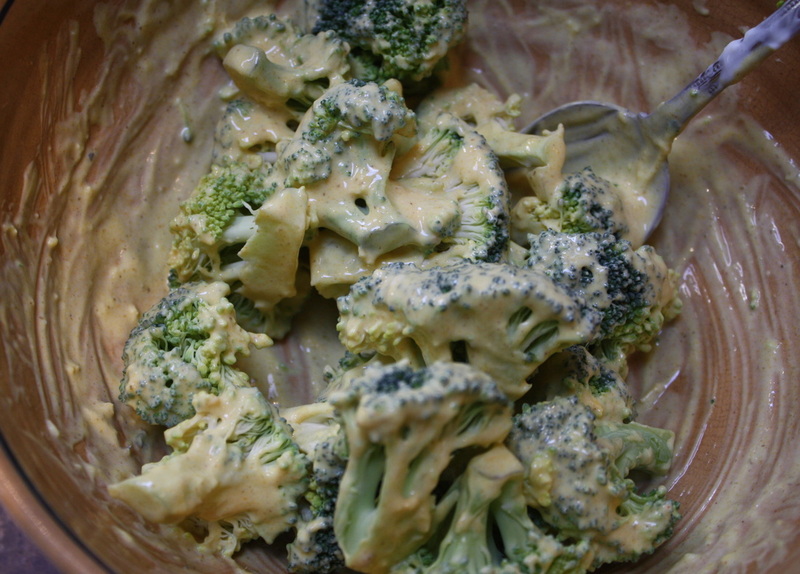 Pull a chair up to the counter and let them mix the batter, lick the spoon, peel the brussel sprouts. They will hold the memory of those simple things close to their hearts in years to come. No matter where life takes them, you'll be there. I hope you have something on your table tomorrow that is inspired by your mother and Christmases past and something that your children will have on their tables in Christmases future. Apologies for my absence - I've been making my list and checking it twice. And I've been busy baking lots of Naughty Christmas goodies! But here is a treat from the Nice list that will make your kitchen smell of holiday cheer with the added bonus of Apples to help make them worthy. I'll try to elaborate a little on 'An Apple A Day Keeps the Doctor Away,' but that really does sum them up. Multiple large and longterm studies show that people who are frequent apple eaters have a lower risk of death from coronary and cardiovascular disease and have a lower risk of stroke compared to non-apple eaters. This is credited to the antioxidant compounds that are plentiful in apples. Flavonoids (plant based antioxidants) found in apples are also associated with a lower risk for certain cancers. Laboratory studies have shown that apple extracts inhibit the growth and further production of colon and lung cancer cells. In both a Finnish study and a study at the Cancer Research Center, Univ. of Hawaii, an inverse association was found between lung cancer risk and the intake of quercetin (a flavonoid) found in apples. An "inverse association" means that the higher the intake, the lower the risk - the lower the intake, the higher the risk. The Finnish study included 10,000 men/women and had a 24 year follow up. Eating apples is also associated with lower rates of metabolic syndrome. Metabolic syndrome means you have three or more metabolism related disorders, such as obesity, high blood pressure, high blood sugars, high cholesterol. A National Health and Nutrition Examination study found that apple eaters have lower levels of C-reactive protein (high levels are associated with inflammation). I had some leftover apple sauce in the fridge and wanted to use it for some better baking. If you don't have any leftover, simply peel and chop 2 apples, put them into a saucepan with a splash of water (1 tablespoon-ish), cover and simmer until soft. Mash. 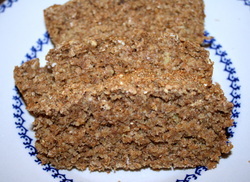 You may need to add an extra splash or two of water as they cook - depends on the type of apple used. Whisk dry ingredients (flour, oats, cinnamon, salt, baking powder, bread soda) together in a bowl and set aside. In a separate mixing bowl, mix wet ingredients (applesauce, egg, lemon juice, coconut oil, vanilla) and the brown sugar. Add dry ingredients into wet ingredients and mix well - can use a large spoon, no need for electric mixer. Allow to cool! I know it smells good, but the flavors in this bread increase as it cools. "Patience is bitter, but its fruit is sweet!" Aristotle's mother must have made him wait for his Jolly Apple Bread, too. *Note: Try using the batter in mini-muffins, too. Easy to pop into lunch boxes and mouths. Good For ME! Technical Difficulties Fixed! Apologies - you can now view and download documents from the previous post, "Good For ME! Help Children Learn Healthy Eating - They're Worth It!" To download documents, click on the highlighted .pdf file below each image. Good For ME! Help Children Learn Healthy Eating - They're Worth It!! Healthy eating should be a way of living that will promote health, growth and well-being. As adults, many of us have turned to healthy eating to cure our ills, whether that's extra weight or lack of fitness - and it's great that we have. But we can't wait until our children are adults to have them learn about nutrition and fitness; we need to instill values and practices now that they can apply in their own lives. We can't push that responsibility onto them, and we shouldn't assume they'll pick it up in school or through government initiatives. Children can learn about healthy eating through school and campaigns, but we need to help them put it into practice in our homes and families. Safefood in Ireland launches a campaign to fight childhood obesity today. Here are the facts: 1 in 4 children is overweight or obese. Obese children are likely to become obese adults. Many parents don't recognize when their child is overweight. 4 out of 5 children aren't getting enough physical activity. Safefood is also highlighting some of the short term effects: problems with bone health, breathing difficulties and psychological/social effects. And long term effects: cancer, heart disease and diabetes. The statistics are grim, but statistics don't show us how to change our habits. Safefood is attempting to highlight the problem, but we need to create solutions. Having spoken to children about healthy eating in classroom and group settings, there are a few ideas I want to share. We tell kids they'll get vitamins and minerals from food, but we don't tell them what that means. They learn the words but not the value or the practice. We tell them sugar is bad but we don't make it relatable. They're not understanding what has sugar, how much it has and how much is too much. We tell them to eat 5 portions of fruit and vegetables per day, but we might not be giving them 5 portions per day! I developed a few tools I think can help - please, download them and use them in your home or classroom. 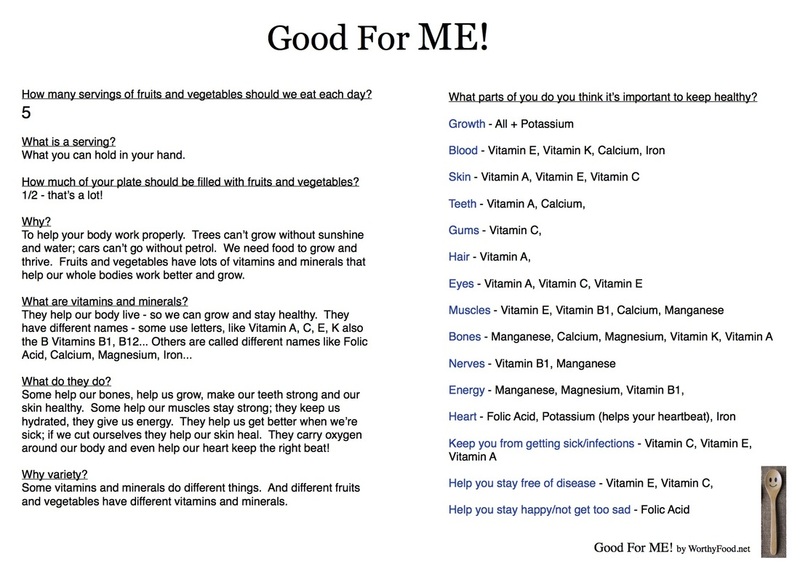 To help children understand vitamins and minerals - what they are, what they do, how much we need, and what foods they're in - I've written 2 sheets that clearly explain what vitamins and minerals are and in what fruits and vegetables we find them. To put into practice the healthy habit of eating 5 portions of fruit and vegetables per day, I created 2 printables. The first is a teddy bear dot-to-dot. 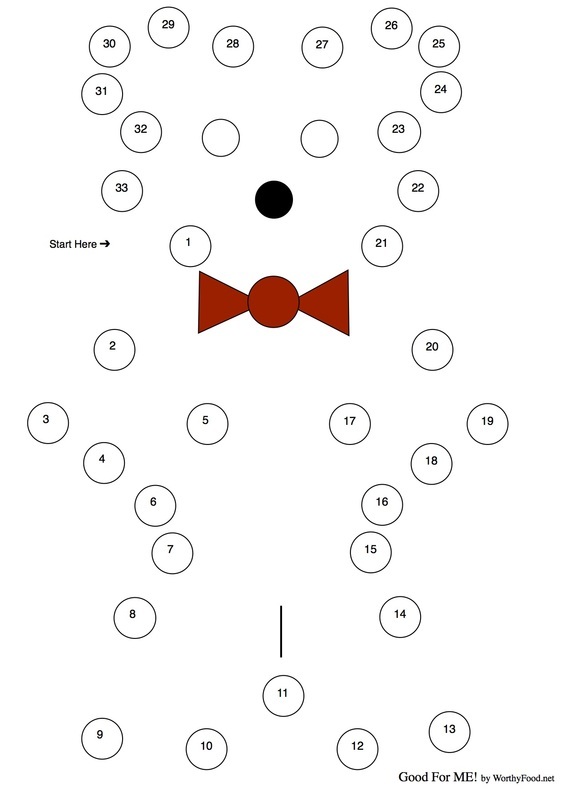 It has 33 dots to connect plus 2 eyes. Kids color in a dot each time they eat a fruit or vegetable - if they color all 35 they'll have eaten 5 portions for the 7 days that week. 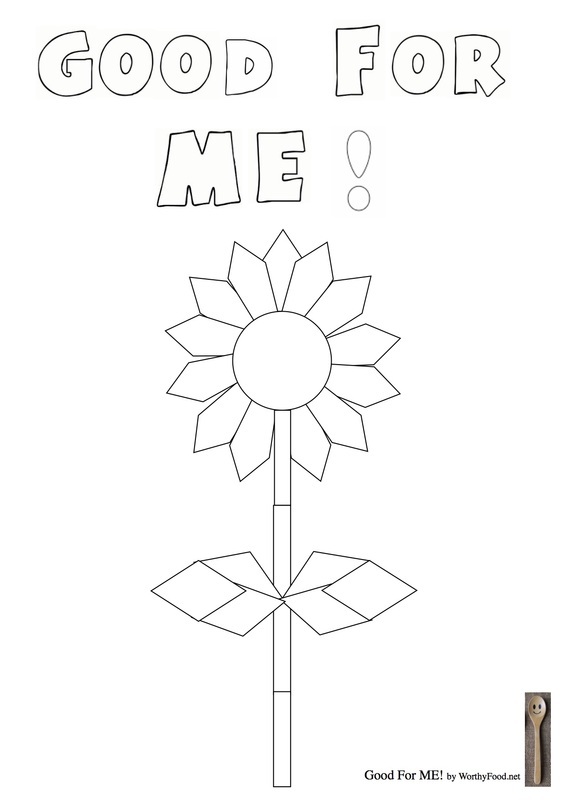 The second is a Good For Me Sunflower. Again, they can color in a section each time they have a fruit or vegetable - there are 35 all together - 5 a day for 7 days. These not only help the kids see how many portions they're eating, it encourages us as parents and caregivers to actually serve or provide enough! Encourage kids to use the color of the fruit or vegetable they've eaten when coloring in - this way they can see how much (or how little) variety they're consuming. job for ourselves. And we're feeding you guys almost twice as much sugar as we had when we were kids. You can blame us when you're older and not feeling great, but that won't make you better. You need to learn why it's important to look after yourself. Let's talk about what you don't want: sugar. I know you think you want it! And sugar is what our body burns for fuel - but we can get the sugar we need from natural food sources - when we have too much sugar, our body turns it into fat and stores it. Consuming too much sugar increases our risk for heart disease - even for young people! If we become obese, we increase our risk for a variety of cancers, diabetes, weak bones, breathing problems and more. Obesity is an epidemic in Ireland and globally. (Epidemic means it's a problem for a great number of people.) The World Health Organization says that body weight is now the most common childhood disease. In Ireland, more adults are facing obesity than smoke - and we know how bad smoking is. So, this is serious! And we need to change what we're eating and we can't wait. One way to lower the amount of sugar you have is to cut out - or at least limit - sugary drinks. The World Health Organization recommends that you have no more than 45 grams of added sugar per day. Did you know that 1 can of Coke has 39 grams of sugar? A bottle of Lucozade has 64 grams! Even 1 cup of unsweetened apple juice has 24 grams of sugar. Make sure you're thinking of sugary drinks as treats - they're not what you should be drinking when you're thirsty. Water is really the best for that. And while we're on the subject of treats, let's remember the definition of that word: "an event or item that is out of the ordinary..." That means it's not something you have every day! Enjoy your treats, but keep them for special occasions. Let's talk about what you do want: Eat 5 portions of fruits and vegetables every day - and eat a variety of them so you get lots of different vitamins and minerals. Eat protein, which helps to build and care for all of the material your body is made of: muscles, blood, organs, every cell. Protein also helps move those vitamins and minerals around your body so they can get to where they need to go. You get protein by eating meat, seafood, eggs, beans, peas, nuts and seeds. Eat grains, they give your body vitamins and minerals, too. 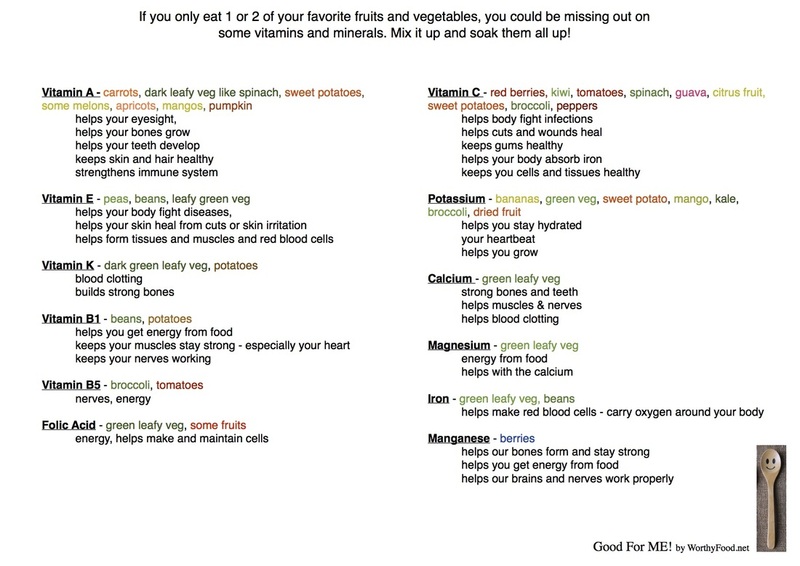 They're also important for your digestive system (the way your body absorbs nutrition and moves it around your body). Some examples of grains are oats, rice, whole wheat flour, bread, pasta. Eat/Drink dairy to help you develop strong bones and teeth. You can get dairy from milk, yogurt, cheese. And you also want to be active - that's the easy part: play, run, walk - get moving. I hope this helps you to help the children in your life! They're worth it. 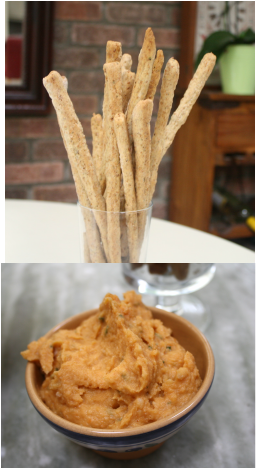 I finally made a healthier version of breadsticks that turned out crispy and tasty. Much happier response from husband - and kids, too! They were devoured within an hour. I've had quite a few attempts at a healthier breadstick - cutting the olive oil and upping the whole wheat flour kept giving me tasty but not crispy results. This time, the combination is right and they were exactly as I'd hoped. So, finally, success! In a small bowl, whisk water, sugar and yeast together. Let sit for few minutes to proof - should be bubbly and frothy when ready. In the meantime, combine flours, oregano, basil, garlic powder and sea salt in a medium or large mixing bowl. Whisk or mix to distribute ingredients. Add olive oil and mix well with spoon - try to incorporate olive oil throughout. 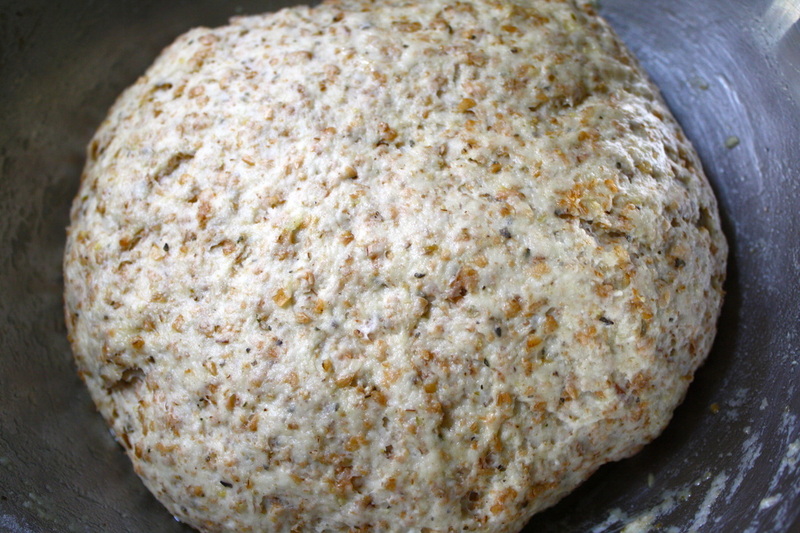 Add water/yeast mix and mix well with spoon - should come together into a slightly sticky ball of dough. 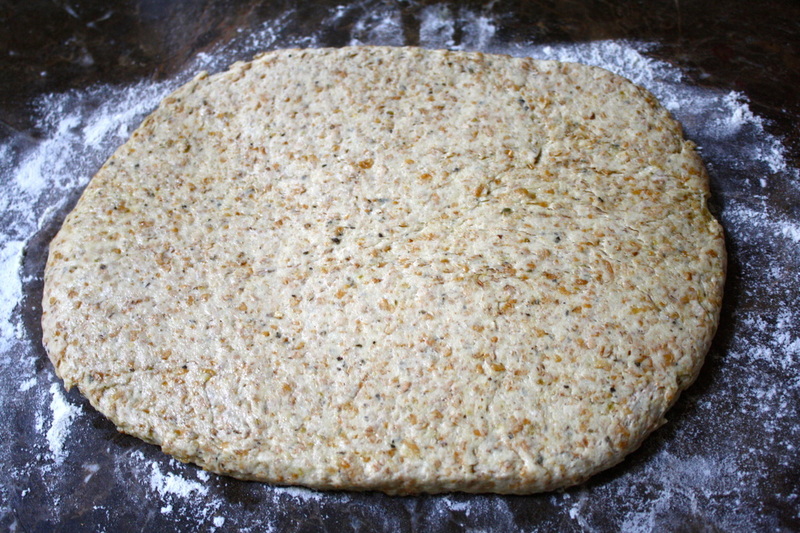 Sprinkle some flour (I used the white) onto your work surface and turn dough onto it. Knead for 5 minutes, adding small sprinklings of flour, either to your hands to onto dough, to keep it from becoming too sticky. 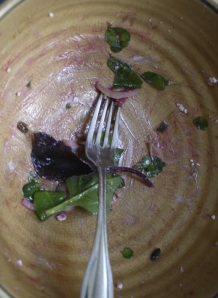 Lightly coat a bowl (can wipe and reuse the mixing bowl) with some olive oil. Place ball of dough in, cover with plastic wrap and put someplace somewhat warm and allow to rest for 1 hour. Preheat oven to 190ºC (170ºC fan oven/375ºF) and lightly oil 3 baking trays. Punch down dough and turn onto floured work surface. Use a rolling pin to lightly roll dough into a rectangular shape about 1-2 centimeters thick. Use a large, sharp knife to cut into strips. 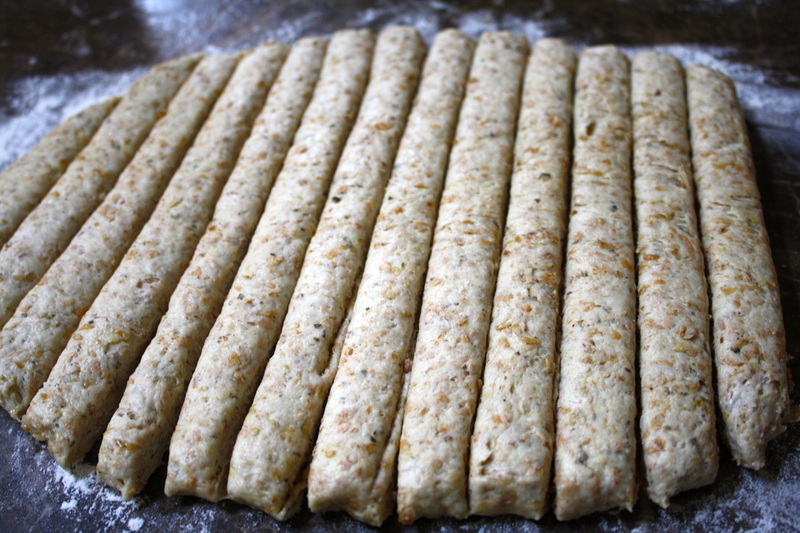 Use your hands to roll each strip into long thin sticks - you'll have to cut into sections to fit onto baking tray. Roll the breadstick on baking tray to very lightly coat with the olive oil from tray. Bake for 20 minutes total, flip over once after 10-15 minutes of baking time. Peel and chop sweet potato - boil until soft and mash. 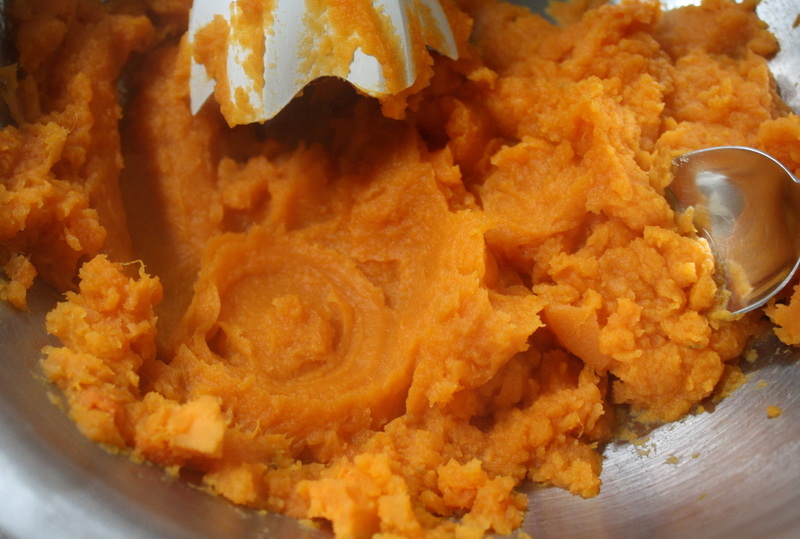 Use a food processor or hand blender to purée well. Drain and rinse beans and put into a mixing bowl. Add sweet potato, olive oil, water, sea salt, cayenne pepper and rosemary. Mix well and again, use a food processor or hand blender to purée. Don't forget - this dip delivers goodness along with taste! Sweet potatoes = low fat/calorie and great Vitamin A and fibre content plus potassium, iron, magnesium, calcium, Vitamin C and protein. And cannellini beans = lots of protein (most of plant based foods), loads of fibre, and packed with minerals such as iron, calcium, manganese, potassium. Also has a great supply of folate.